The Kawasaki Ki-10 Type 95, Allied Code name Perry, was the last biplane fighter of the Imperial Japanese Army Air Force. It was an extremely maneuverable fighter with a very light armament of two 7.7mm machine guns firing through the propeller (would have been a wonderful fighter in WW1!) 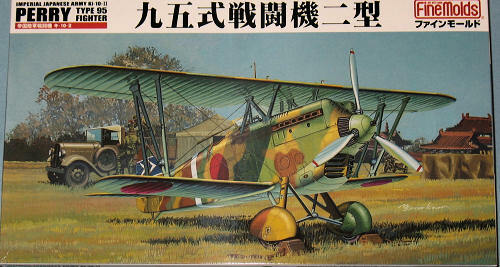 The plane served with the IJAAF on the front line in China during the early days of the Sino-Japanese War till about 1939 by which time it was very obsolete. Designed by Takeo Doi, who later designed the much more impressive Ki-61 Hien, this plane won a mid 30s fighter selection by the ultra conservative IJAAF who prized maneuverability about all else and an apparent disgust/fear of monoplanes. The plane it beat eventually became the Ki-27 “Nate” when the IJAAF generals finally shed their disgust/fear of the monoplane. One can see how this WW1 maneuverability fetish carried through in the early IJAAF WW2 fighter planes which were extremely maneuverable, underpowered, under protected and under armed compared to other nations WW2 fighters with more armor, heavier caliber weapons and much more powerful engines. By 1942, most if not all Ki-10s were relegated to training duties and/or 2nd line roles. Fine Molds 1/48 airplane kits tend to focus on Japanese subjects which are not very popular outside of Japan and helps explain why their instructions and histories are written in Japanese. However, not being able to read Kanji characters is not a problem as I find the Fine Molds instruction diagrams to be excellent plus all the colors are mentioned in English. 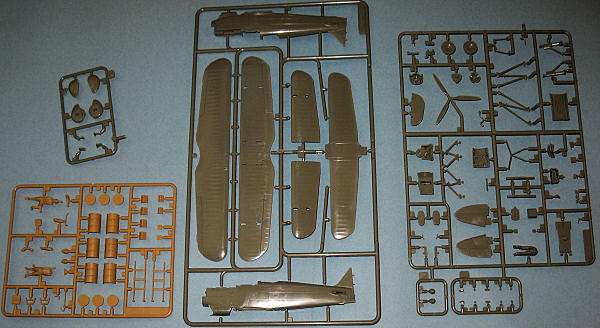 The kit comes with 5 gray green injection molded sprues for a total of 78 parts including one seated pilot figure, one clear sprue of 3 parts and also comes with a separate sandy brown plastic sprue of 24 parts that includes two maintenance figures plus various fueling accessories for diorama purposes if one so chooses. The parts are free of flash and molding defects and the panel lines are crisp and finely done. 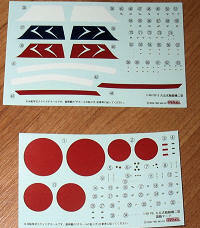 It also has two small decal sheets with extensive stencils and markings for two aircraft. One thing they have provided is white background decals for the tail markings and fuselage bands. Both markings for the 77th Air Regiment based in China. Two small complaints about the kit. One is that t the box art does not match up with the either of two marking options supplied with the kit which may confuse some folks. The other is that there is no wiring diagram supplied so you will have to base it on the box art. If you like doing 1920-1930 interwar aircraft, obscure Japanese subjects and/or a modeler who wants to build a biplane with simple rigging then this is one kit you would probably like to have. It looks very good in the box and based on my previous experience with Fine Molds Star Wars kits, I’m hoping that it builds just as well as it looks.